These cheese straws smelled so good when they came out of the oven that I had a hard time controlling myself long enough to take a photo. Once I got a decent enough shot, Eugene and I dove right in and devoured them alongside a bowl of egg salad. An odd meal, but also oddly perfect. The straws are a great mix salty, chewy, and crisp with just a hint of heat from the cracked black pepper. When Eugene took his first bite, he turned to me and said, "These are so good they make me angry! I'm mad that I had to wait 26 years to taste this!" Needless to say, we didn't have any leftovers. Normal people (i.e. not us) might prefer to serve these when company comes over. They go quickly though, so I would highly, highly recommend doubling the recipe. This way you won't get stuck wishing you'd made more. 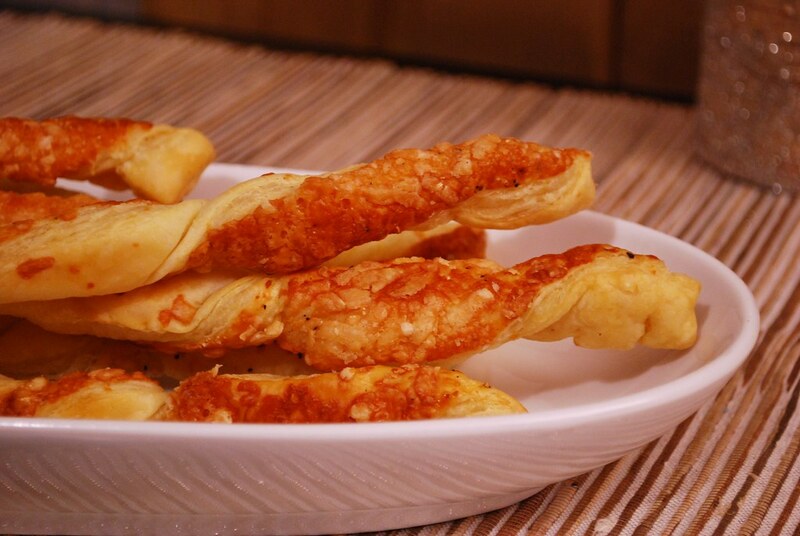 These cheese straws also lend themselves well to adaptation. Experiment using a blend of cheeses and added spices. Think Asiago or cheddar, or perhaps a dash of cayenne or rosemary. You can also cut the puff pastry into 1" pieces for a fun and "pop-able" snack. Lightly flour you work surface then roll out both sheets of puff pastry. Go over them both with a rolling pin just to smooth them out slightly. Brush the surface of both sheets lightly with the beaten egg. Sprinkle both sheets liberally and evenly with the grated cheese and then generously sprinkle with freshly cracked black pepper. Run over the sheets with your rolling pin to press the seasonings and cheese into the pastry. Sprinkle lightly with Kosher salt. Used a pizza cutter or sharp knife to cut each sheet legnthwise into 10-12 strips each. Twist the strips and arrange on baking sheets lined with parchment paper, about 1" apart. Bake for 10-12 minutes until they begin to turn golden and puff slightly. Turn each twist over and let bake for an additional 3-5 minutes or until golden and puffed. Be sure to keep an eye on them at the end since the cheese can easily burn. oh my goodness!!! that looks so delicious! puff pastry is just wonderful!